In-booth book signings - September 21, 2019 at the Breslin Center. 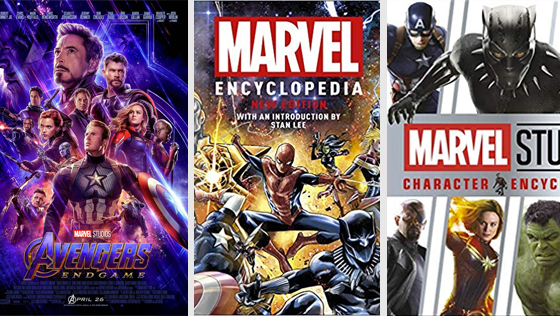 Marvel Studios Character Encyclopedia and Marvel Encyclopedia book signing (as well as other Marvel and Star Wars books), Petoskey Cinema near Walmart in Petoskey, MI - April 25-28. Daily in-booth book signings for Marvel Studios Visual Dictionary and Marvel Studios: 101. Official panelist/host. 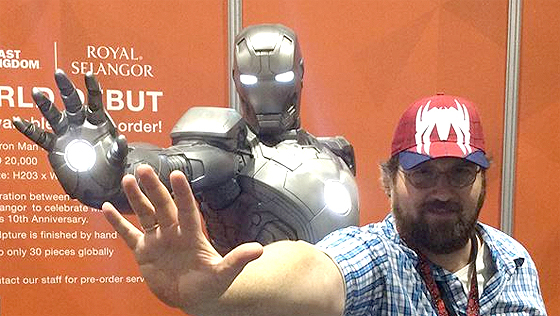 Daily in-booth book signings for Marvel Studios Visual Dictionary (global book launch). Daily in-booth book signings. Penguin RandomHouse Publisher Party. 501st Legion Party. Steel Wars podcast appearance. 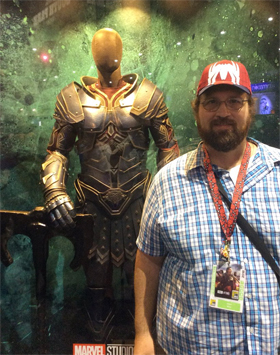 While visiting my friends at the Weta Workshop booth, I got to examine Scourge's costume from Marvel Studios' 'Thor: Ragnarok (seen right). 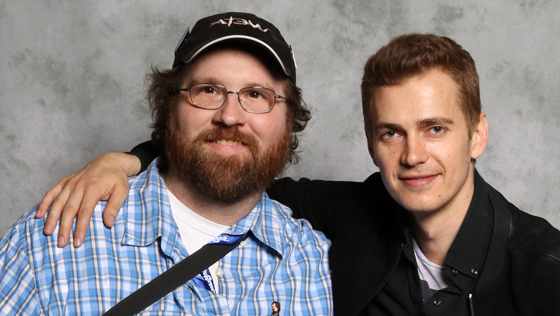 Adam Bray and Actor Hayden Christensen (Anakin Skywalker) at Star Wars Celebration Orlando, 2017. In-store book signing of Star Wars: The Visual Encyclopedia. Daily in-booth book signings with co-author Lorraine Cink for Ultimate Star Wars. Presentation and book signing at Boyne City Public Library (Michigan) for national publicity event. In-booth book signings of Star Wars: The Visual Encyclopedia. 16 stops: Orlando, FL (Once Upon a Toy, Disney Springs, April 21); Decatur, GA (Little Shop of Stories, April 23); Houston, TX (Brazos Bookstore, April 24); Austin, TX (Book People & 2 school visits); Denver, CO (Dungeon & Drafts Bar with Old Firehouse Books, April 27); Denver, CO (Tattered Cover, April 28); Fort Collins, CO (Old Firehouse Books, April 29); Phoenix, AZ (Changing Hands, April 30); Phoenix, AZ (2 school visits, May 1); Salt Lake City, UT (The King’s English Bookshop, May 3); Santa Monica, CA (Santa Monica Public Library, May 4); Carlsbad, CA (Georgina Cole Library, May 5); San Diego, CA (Mysterious Galaxy, May 6). Official convention panelist (2 panels), Daily in-booth book signings, 501st party, Rebel Force Radio party. 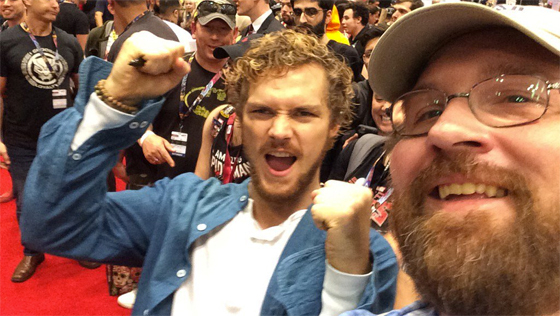 Actor Finn Jones (Marvel's Iron Fist, aka Danny Rand) and Adam Bray at New York Comic-Con, 2016.
by the Great Lakes Garrison during Grand Rapids Comic-Con 2016. Official guest panelist/host. Book signing. 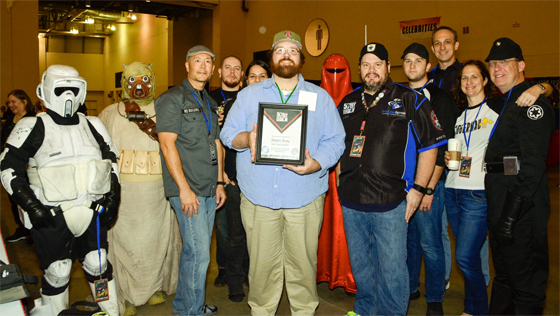 Inducted as an honorary member of the 501st Legion. Daily in-booth book signings with co-authors Lorraine Cink and John Sazaklis for Marvel: Absolutely Everything You Need to Know. Met Stan Lee! 10 stops: Tempe, AZ (Changing Hands, September 10); Menlo Park, Sunnyvale and San Francisco, CA (Keplers, 1 school visit & Lucasfilm visit, September 11); Lake Forest Park, WA (Third Place Books, September 14); Beaverton, OR (Powell’s, September 15); Chattanooga, TN (McKay’s, September 22); Louisville, KY (Carmichael’s, September 23); Cincinnati, OH (Joseph-Beth Booksellers, September 24); Winnetka, IL (The Book Stall, September 25). Daily In-Booth Book Signings. Official guest panelist. Guest on Emmy-Nominated The Star Wars Show. Guest on Fangirls Going Rogue and Radio 1138 (Take Cover). 501st Legion Party at Madame Tussauds. Official Lucasfilm Publishing panelist. Lucasfilm Publishing book signing. 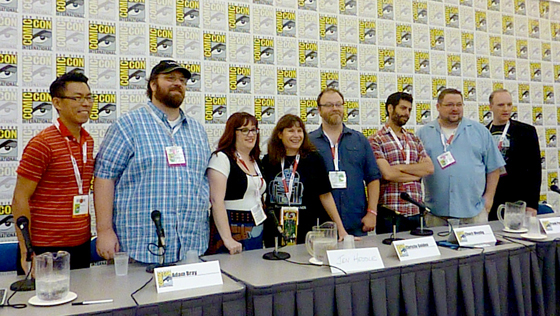 Adam Bray speaking at the Lucasfilm Publishing Panel at San Diego Comic-Con 2015. Star Wars: Absolutely Everything You Need to Know book signing, Petoskey Cinema, MI. Promoted with appearance on The Vic McCarty Show. 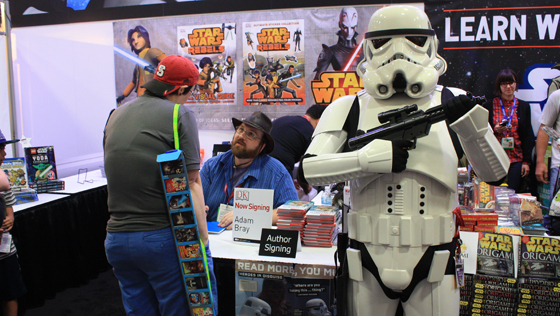 Daily in-booth book signings for Ultimate Star Wars and Star Wars: Absolutely Everything You Need to Know. Official Lucasfilm panelist for Journey to Star Wars: The Force Awakens. 9 stops: San Diego, CA (Mysterious Galaxy, September 3-4 FORCE FRIDAY international book launch for The Force Awakens tie-in products); Los Angeles, CA (Children’s Book World, September 4); Phoenix, AZ (Changing Hands Bookstore, September 5); Denver, CO (Tattered Cover Bookstore, September 6); Lookout Mountain, GA (Covenant College, September 10); Chattanooga, TN (McKay’s Bookstore, September 11); Hudson, OH (The Learned Owl, September 12); Washington D.C. (Barstons Child Play, September 13); Woodbridge, VA (2nd & Charles, September 13). 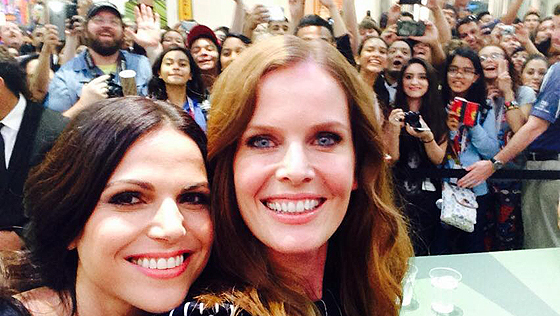 A fun San Diego Comic-Con photo-bomb via the Twitter feeds of actresses Rebecca Mader and Lana Parrilla. Daily in-booth book signings of Ultimate Star Wars and other books. Official Lucasfilm Publishing panelist. Penguin Random House Party, 501st Party. 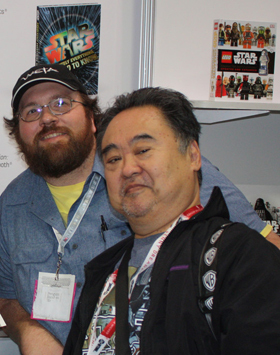 I was honored to receive a visit from actor Keone Young (Commander Sato from Star Wars Rebels) during my book signing (pictured right). 16 stops: Indianapolis, IN (WTHR-TV Eyewitness News at Noon, May 2); Fishers, IN (Star Wars Festival at Hamilton East Public Library); Lexington, KY (Joseph-Beth Booksellers, May 3); Phoenix, AZ (AZTV ”Morning Scramble” & “Good Morning! Arizona” & FOX10 News, May 4); Tempe, AZ (Changing Hands Bookstore, May 4); San Diego, CA (KPBS Midday Edition, May 6), Carlsbad, CA (Carlsbad Library with Barnes & Noble, May 6); Pasadena, CA (Vroman’s Bookstore, May 8); Beaverton, OR (Powell’s Bookstore, May 9); Winnetka, IL (The Book Stall at Chestnut Court, June 5); Chicago, IL (WLUP 97.9 FM The Loop “The Mancow Muller Show”, June 5); Joliet, IL (Star Wars Festival, Joliet Library, June 6); Midland, MI (Barnes & Noble, July 18); Petoskey, MI (McLean & Eakin Booksellers, July 25). Official convention panelist (2 panels), Ultimate Star Wars book launch party with actor Anthony Daniels (C-3PO), Daily in-booth book signings, 501st party, Rebel Force Radio party. Adam Bray signings DK Star Wars Rebels: The Visual Guide at San Diego Comic-Con. 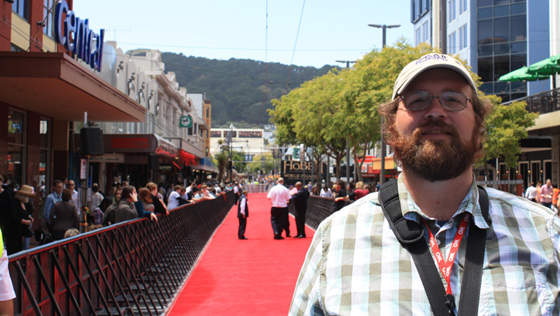 Adam Bray at the Red Carpet World Premiere of The Hobbit: An Unexpected Journey in Wellington, New Zealand. One-week press tour of tourism sites, including San Francisco and the region south. With credentials from Warner Brothers and Tourism New Zealand: Red Carpet press access to cast, crew and VIPs, official premier events, party with Peter Jackson and cast, toured film locations around the country. 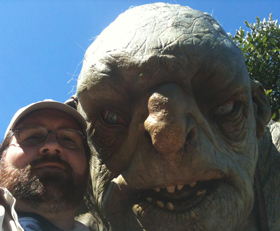 I also made a new troll friend at Weta Workshop (see right selfie). Invited guest at symposium with government officials, archaeologists and international tourism representatives to discuss the potential for Vietnam's newly discovered Long Wall of Quang Ngai. Attended official ceremony to designate the ancient structural system as a national monument with historical and tourism significance. As a result, I wrote articles for CNN , BBC Travel, National Geographic and various Vietnam travel guides featuring the Long Wall of Quang Ngai. Not my usual sort of gig! It produced one article for CNN. Nationwide tourism press tour, including a visit to see the mountain gorillas in Rawanda's Virunga National Park.